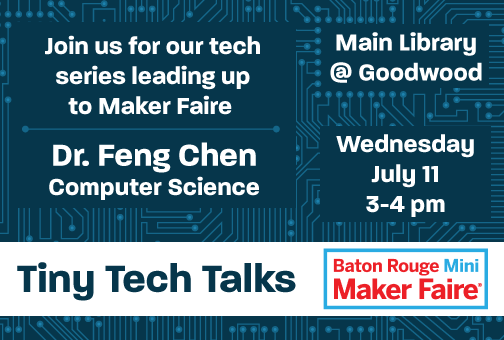 Louisiana State University (LSU) Division of Computer Sciences and Engineering Professor Dr. Feng Chen joins us for the first in a series of educational talks featuring technology educational professionals at the Main Library at Goodwood at 3 p.m. Wednesday, July 11! Adults and teens will hear from educators from across the state who’ll discuss different areas of specialty including computer sciences, engineering and everything in between. You won’t want to miss it!